Why wearing compression garments after cosmetic surgery is important to aid recovery and ensure the best results. A variety of products are available – both standard and custom-made. Standard garments are available from most plastic surgeon’s offices and may be included in the cost of your cosmetic procedure. Your plastic surgeon will normally be able to recommend the correct garment model and size, based on your measurements and the type of procedure you’ve had. Custom made garments however (such as pressure garments for burns scar management), are usually made to measure by occupational therapists. The duration of post-surgical garment use should be discussed with your surgeon. It may range between six weeks and six months. In cases of burns scar management, the duration may be extended until scars soften and mature, which may take up to 18 months. It is imperative to wear a post-surgical supportive bra after breast augmentation. As part of healing, your body forms a fibrous capsule around the implant which supports the implant in the correct position. This capsule takes about eight weeks to develop. During this time, the implants must be maintained in the correct position with a post-surgical bra, and sometimes, an additional stability band. Failure to wear post-surgical garments after a breast augmentation may result in implant malposition, which may require further surgery to correct. It is advisable to wear a post-surgical bra for six weeks following breast reduction or lift. 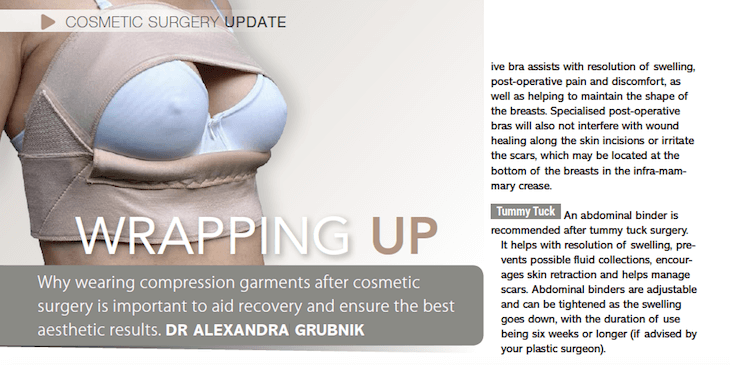 A supportive bra assists with resolution of swelling, post-operative pain and discomfort, as well as helping to maintain the shape of the breasts. Specialised post-operative bras will also not interfere with wound healing along the skin incisions or irritate the scars, which may be located at the bottom of the breasts in the infra-mammary crease. An abdominal binder is recommended after tummy tuck surgery. It helps with resolution of swelling, prevents possible fluid collections, encourages skin retraction and helps manage scars. Abdominal binders are adjustable and can be tightened as the swelling goes down, with the duration of use being six weeks or longer (if advised by your plastic surgeon). Post liposuction garments vary dependent on the treated area. For instance, after abdominal and flank liposuction, an abdominal binder is appropriate – while compression pants (short, three-quarter or full length) are recommended after liposuction of the buttocks, saddle bags, thighs, knees and legs. The duration of use should be at least six weeks, and may be extended to intermittent use for a further six months to improve skin retraction and final aesthetic result. A compression neck band should be used following neck lift surgery, but unlike other garments, shouldn’t be worn tight as this may impede venous drainage of the face. It aims to support the skin of the neck and encourage skin retraction and healing, while minimising the risk of fluid collection under the elevated skin flaps. The duration of use should be discussed with your plastic surgeon, as it depends on the type of face and neck lift that you had. In summary, post-surgical garments are an integral part of the recovery period, as they greatly assist with obtaining the best aesthetic results following both cosmetic and reconstructive surgery. A2 Disclaimer: This article is published for information purposes only, and should therefore not be regarded as a replacement for sound medical advice. 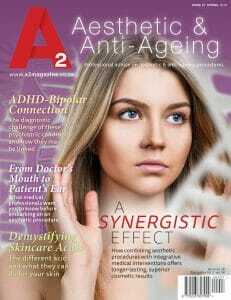 This article was written by Dr Alexandra Grubnik and edited by the A2 team EXCLUSIVELY for the A2 Aesthetic & Anti-Ageing Magazine Spring / September 2018 Edition (Issue 27). Dr Alexandra Grubnik MMed, FC Plast Surg SA - Dr Alexandra Grubnik is a plastic reconstructive surgeon practicing at the Netcare Milpark and Netcare Rosebank hospitals in South Africa. She has a special interest in breast surgery, breast reconstruction, body contouring and cosmetic surgery. Dr Grubnik completed her training at the University of the Witwatersrand, where she holds a Master of Medicine in Plastic Surgery – and is a fellow of the College of Plastic Surgeons of South Africa. She is also a member of the Association of Plastic, Reconstructive and Aesthetic Surgeons of South Africa (APRASSA), as well as the International Society of Aesthetic Plastic Surgery (ISAPS). Dr Grubnik furthermore holds full registration with the Health Professions Council of South Africa (HPCSA) and the General Medical Council (GMC) in the UK.